resulting in isometric muscle contraction and increased blood flow to prevent and treat a wide range of acute and chronic medical conditions. We develop multi-application wearable therapy devices. 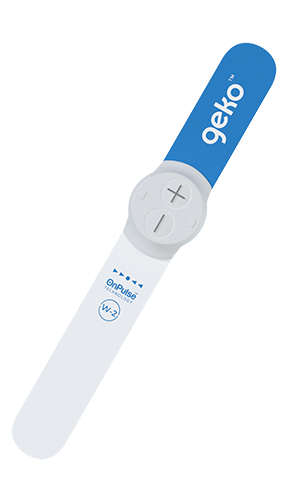 Our clinically proven OnPulse™ technology, embedded in the geko™ device, combines a deep understanding or neuromuscular electrostimulation (NMES) with user-friendly wearable design. Mimicking the body’s own nerve signals, OnPulse™ NMES-induced muscle contraction elicits low force ankle dorsiflexion via the common peroneal nerve stimulation, differentiating OnPulse™ from traditional NMES, such as muscle stimulators, which use electrical stimulation, direct to the muscle bulk, to force contraction within a single muscle – often using stimulus amplitudes that are large and not without discomfort1. OnPulse™ low frequency nerve stimulation delivers current transcutaneously via non-invasive skin surface electrodes placed on the common peroneal nerve that winds around the neck of the fibula bone, behind the fibula head, with conductive hydrogel to facilitate adhesion and the movement of the current from the electrode into the skin. Clinically proven, OnPulse™ technology stimulates the motor neurones within the nerve bundle (common fibular nerve; external popliteal nerve; lateral popliteal nerve) that carry signals to the muscle fibres to cause contraction. By stimulating the common peroneal nerve, proximal to the posterior/anterior bifurcation, OnPulse™ simultaneously activates the tibialis, peroneus longus and lateral gastrocnemius muscles. Together, their simultaneous contraction compresses the venous system, efficiently evacuating blood in the deep veins of the calf2, at a rate equal to 60%3 of walking, with no change to heart rate or blood pressure. Electrical stimulation devices broadly fall into three categories: neuromuscular electrical stimulation (NMES – OnPulse™ technology delivers muscle contraction via indirect nerve stimulation to increase blood flow), transcutaneous electrical nerve stimulation (TENS – historically used for pain relief) and functional electrical stimulation (FES – extensively used for muscle strengthening). These terms, however, are often used interchangeably in the literature, which can result in confusion. It is therefore important to look at the parameters of a device in order to determine clinical effect rather than a category label. Unlike any other form of NMES, OnPulse™ technology generates intermittent limb compression without external compression,to elicit muscle contraction in the calf compartment. 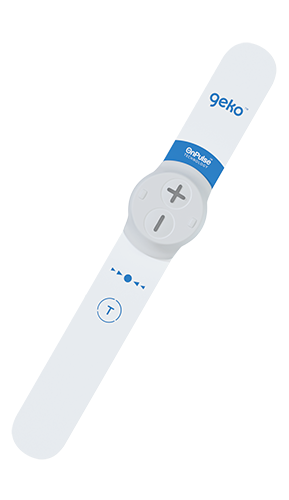 As our understanding of new clinical applications and care pathways expand, we upload new treatment parameters into our NMES devices to deliver 1ˢᵗ in world therapeutic outcomes for patients. J. Thomas Mortimer and Narendra Bhadra (2004) PERIPHERAL NERVE AND MUSCLE STIMULATION. Neuroprosthetics: pp. 638-682. Tucker A, Maass A, Bain D, Chen LH, Azzam M, Dawson H, et al. 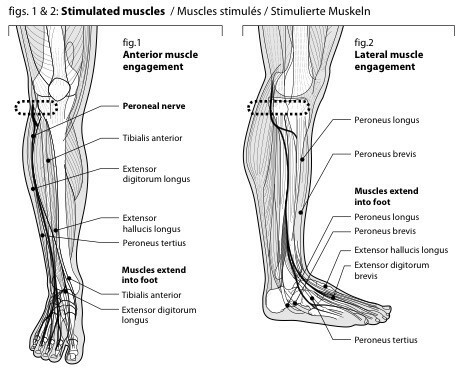 Augmentation of venous, arterial and microvascular blood supply in the leg by isometric neuromuscular stimulation via the peroneal nerve. The International journal of angiology: official publication of the International College of Angiology, Inc. 2010 Spring; 19(1): e31-7.